The Okuma Trio High Speed Spinning Reel is a typical innovation in the construction of spinning reels, an improvement compared with the original version of Trio.The reel is not only stable and strong but also has light weight due to the graphite design. The Okuma Trio High Speed Spinning Reel is a typical innovation in the construction of spinning reels, an improvement compared with the original version of Trio. With an increase in the gear ratio, from 5:1 to 6.2:1, the retrieving process will be faster and more efficient. The Crossover Construction with the combination between aluminium, creating good strength, and the lightweight material graphite helps the anglers control the reel more easily. Moreover, advanced casting features and excellent drag system are new technologies that are incorporated in to the new Trio. This overall review will give you more motivation to purchase an ideal fishing reel. Using both aluminium and graphite materials, Trio is suitable for several kinds of fishing applcations even for inshore saltwater with the feeling of stability and smoothness. The two standards, whether gearing or high-speed, will make the most enjoyable and outstanding performance that you wish. By several advanced features like The powerful Dual Force Drag, the CRC corrosion resistant coating, the EOS elliptical oscillation system and HPB high performance bearings, the new Trio really makes a huge position in the market of fishing reels. In the Crossover Body of Okuma Trio High Speed Spinning Reel, there exist an aluminum stem and two graphite side plates. The high strength of aluminium stem will keep all things in alignment while the graphite side plates makes the reel lighter and comfortable to handle and control it. In addition, the smoothness and stability of this kind of reel is also created by the construction from multiple pieces, making the drag system always in an Aluminum Drag Chamber. Another benefits that Okuma Trio High Speed Spinning Reel brings to customers is the Dual Force Drag system (DFD system). The body built with several discs of drag washers and thus provides both the top and bottom spool tension. Thanks to the feature, the reel tends to dissipate the heat more quickly. Plus, the Elliptical Oscillation System can keep the reel always in balanced status so that the anglers can experience less wobble in thetime of fishing. In addition, the High Performance Bearings in which the spinning reel features 9BB + 1RB stainless steel bearings is very beneficial to the customers. As many as 9 ball bearings for a spinning reelgives way to a smoother retrieve. Morerover, A quick-set anti-reverse roller bearing, the 1RB, works properly tokeep the handle from spinning backwards and produce more effective and powerful sets of hook. Other important features of this kind of reel are the Trio’s Corrosion Resistant Coating Process, Corrosion Resistant, High Density Gearing, rigid forged aluminum handle and computer-balanced Rotor Equalizing System (RESII). The unbelievable smoothness of Dual Force Drag System. Lightning fast line retrieve owing to the gear ratio of 6.2:1 and the line retrieve of 31’’. Strong and attractive design with anodized aluminum parts in burnt-orange going with carbon graphite. Thanks to the aluminium lip, the performance of casting is always smooth and perfect. Customers require that the retrieve of the 9BB reel be smoother. A large number of customers positively evaluate the advantages of The new Trio High Speed Reel. Let’s take a look at some good comments, as a highly recommended, attractive, functional, quality and well-priced reel. The retrieve is super smooth, even smoother than more expensive reels and the speed of retrieving is excellent. The handle is really light and require no effort to handle it. On the high-speed model, the handle with little “roller” style is enjoyable. The reel is also good for fishing in the saltwater, suitable for high speed and heavy duty. Besides, just some customers have the idea that the reel should have a wider spool and more line capacity to give more room to the anglers in case that the fish make a fast and far run. Moreover, the kinda of a bummer should work better to come with a spare spool. These are only very minor complaints about The new Trio High Speed Reel. In general, it’s really an outstanding reel that is highly recommended to people. 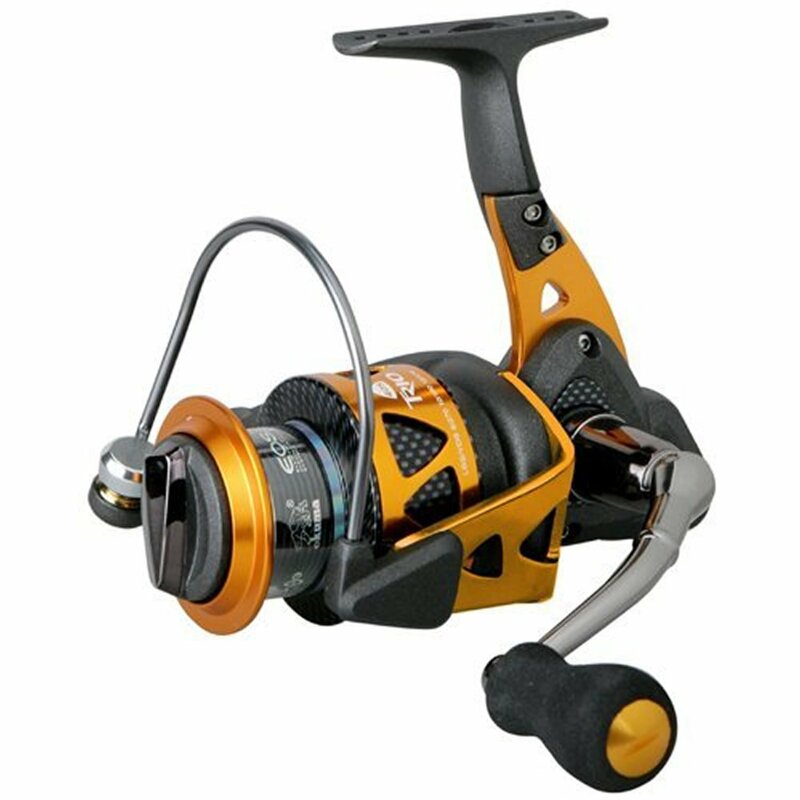 Having a high speed of 6.2:1 gear ratio and the typical burnt-orange anodized accents, the Okuma Trio High Speed Spinning Reel is really perfect in appearnce. In addition, the reel is not only stable and strong, thanks to the aluminium material but it also has light weight due to the graphite design. This is the exclusive and outstanding Crossover Construction. Plus, it is the stamped aluminumrather than the standard diecastaluminumthat helps the reel stem become more and more rigid and takes the stress off the two graphite sideplates. As a result, the lightweight and all internal parts are organized in perfect alignment. The same Crossover technology of the rotor system also created by stamped aluminum and graphite are highly evaluated. For me,the most important advantages of Okuma Trio High Speed Spinning Reel is the drag. I’m sure a Stella or Steez or any of those other $500 reels probably has a more attractive drag system. However, I’ve never had a reel with as smooth a drag as the Trio, even including some in the $200 range. The word that kept popping into my head when a big king or steelie was ripping line was “luxurious,” which is an odd word for a reel drag but that’s just how it felt.Overall, The Trio is really a good bargain because it performs as excellent as a reel that costs twice as much compared to the real cost. Thus, don’t hesitate to go and get it! You can read more information about best spinning reel by click here.